The Pantheon is a building in Rome which was originally built as a temple to all the gods of the Roman state religion, but has been a Christian church since the 7th century AD. It is the only building from the Greco-Roman world which is completely intact and which has been in continuous use throughout its history. 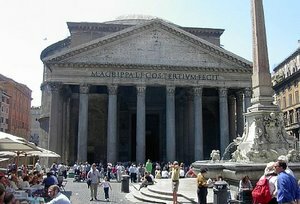 The original Pantheon was built in 27 BC under the Roman Republic, during the third consulship of Marcus Vipsanius Agrippa, and his name is inscribed on the portico of the building. The inscription reads M.AGRIPPA.L.F.COS.TERTIUM.FECIT, "Marcus Agrippa, son of Lucius, Consul for the third time, built this." In fact, Agrippa's Pantheon was destroyed by fire in AD 80, and the Pantheon was completely rebuilt in about AD 125, during the reign of the Emperor Hadrian, as date-stamps on the bricks reveal. It was totally reconstructed, with the text of the original inscription (referring to Agrippa) added to the new facade, a common practice in Hadrian's rebuilding projects all over Rome. Hadrian was a cosmopolitan emperor who travelled widely in the east and was a great admirer of Greek culture. He seems to have intended the Pantheon, a temple to all the gods, to be a sort of ecumenical or syncretist gesture to the subjects of the Roman Empire who did not worship the old gods of Rome, or who (as was increasingly the case) worshipped them under other names. In AD 609 the Byzantine emperor Phocas gave the building to Pope Boniface IV, who reconsecrated it as a Christian church, the Church of the Mary and all the Martyr Saints (Santa Maria ad Martyres), which title it retains. When St. Peter's Basilica was being rebuilt under Pope Urban VIII, the Pope ordered the bronze ceiling of the Pantheon's portico melted down. The bronze was used by Bernini in creating the baldachin above the main altar of the basilica. This led to the Latin proverb, "Quod non fecerunt barbari, fecerunt Barberini" ("What the barbarians did not do, the Barberinis [family name of Urban VIII] did"). Since the Renaissance the Pantheon has been used as a tomb. Among those buried there are the painters Raphael and Annibale Caracci, the architect Baldassare Peruzzi and two kings of Italy: Vittorio Emanuele II and Umberto I, as well as Vittorio Emanuele's Queen, Margharita.